Always On Watch: Semper Vigilans: National Empty Chair Day! Labor Day has been replaced because there are no jobs. I just put an empty chair on my front lawn. That's a great move AOW, i hope it becomes a trend. I can't wait to hear Obama's Labor Day speech. He should just issue an apology and slink away in shame. Let's try that link to Viburnum's post again. About an hour ago I placed an empty Windsor Armchair that's been sitting in my garage gathering grime for years out on the lawn in front of a beautiful hedge of viburnum. Glad to have found a good use for it at last! I t will bug the bejesus out my blockheaded midwestern D'Rat neighbors who make a career -- as D'Rats invariably do -- out of bitching about everything. I wonder how long the chair will remain unstolen or unmolested? Great graphic. 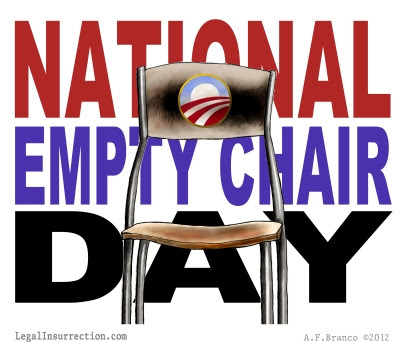 One of the contributors at Right Truth, Susan North, has written an article that will be coming out sometime today about National Empty Chair Day. She has images also. Great idea! Let's see if the media can ignore it. I doubt they can. Have put your link on Twitter , some are retweeting it. Hope a lot follow your idea. You both have a great day ! Saw this and immediately started laughing. Absolutely brilliant! National Empty Chair Day it is. I see the empty chair also symbolizes the fact that Obama is an empty suit. Basically there is no there there. The DNC will be a parade of empty chairs. Here is the list of empty chair occupants. Great post and graphic, AOW -- a picture truly is worth a thousand words! @ Free Thinke -- "I wonder how long the chair will remain unstolen or unmolested?" Until you put a FOR SALE sign on it. @ Bob -- "Here is the list of empty chair occupants." And that's not counting the 'empty chair occupants' that make up all of the delegates. @ Liberalgirliee -- "Obama has created more jobs than Bush did in 8 years." In the private sector -- where REAL money is made to create more REAL jobs? Why are the unemployment figures what they are? Where are these jobs now? Why are we now a nation of 'Food Stamp Queens?' Give me some REAL facts and figures from valid sources -- NOT from your fairy tale, magic wand, pixie dust, skewed numbers that keep drooling out of the side of your mouth. Back it up or shut it up. Liberalmann: Today's Democrat Party is not the same party your parents or mine belonged to. Today's labor unions are not the unions my father or I belonged to. Today's Democrat Party is not progressive. Indeed, the work "progressive" has devolved into a joke, and only an expression for ignorant people to bandy about. Today's Democrat Party is heavily socialistic, and some advocate communism just like some of the old labor bosses. Today's Democrat Party is run by labor bosses and corrupt politicos from such political sewers as Chicago. Notice that Barack Obama is stupid when it comes to foreign relations, but he certainly enjoys launching drones to kill. Chicago pols have always understood killing. Those alleged jobs bills by the Dems would never have created any jobs that added to the economy. These so called jobs would simply drain local governments treasuries to pay these people after the stimulus is gone. The Dems job bills were really dumb. That's why intelligent people opposed them. You have exposed and countered Liberalgirleemann's Democrat 'bolier plate' blather, seamlessly. I'll add one interrogative. B.O. said: "I’ve got four years… If I don’t have this done in three years, then there’s going to be a one-term proposition.” My question: Since by no stretch of the imagination does he "have this done"*, in the elapsed time that he promised, why doesn't he demonstrate the fortitude of his conviction(s) and drop out? OK "fortitude" ha, ha! Re-election of this dork defines insanity! *Unless perhaps a Nation in complete economic disarray is actually what he meant by "done". And you, Liberalguy, are the exact reason that one day there will be another civil war in this country. If things persist the way they are, there will be another civil war. Obama has presided over the loss of about 2,000,000 jobs since he took office. That isn't debatable, its fact. Those jobs are just gone and unless he reigns in the EPA many more will be lost. Don't try to argue with me BW or I'll make it my business to delete every comment you make no matter what it is. I missed National Empty Chair day. Dang. Can I still put one out? Liberalmann spin it any way you want but the economy suuuuuuckssss. I fly the American flag for all holidays. I think the new agenda will be the flag AND a chair! Kind of like the American Legion and the MIA chair at all meetings and functions. GREAT picture by the way. I have stolen it and might find a good use for it. @ blogginator -- No matter how they spin it, I think it's beginning to dawn on some of them that their spin is going into a disastrous tail spin. I can always hold on to that hope, anyway. I fly the American flag 24/7 (with the exception of the Marine Corps birthday, when THAT flag flies) with a spotlight on it that turns on before sunset and goes off after sunrise. Now I'll do the 'chair thing' and see how the Home Owner's Association likes THAT! When cruising by the Bush home in Preston Hollow, the neighborhood association had put out yard signs welcoming George and Laura. One enterprising man had a stack of yard signs he was selling, whilst seated in a lawn chair. Probably the signs yanked out by the malcontents. I like the "Empty Chair" protest because it showcases the best of America. We believe in freedom of expression which does no harm to our neighbor. We also retain our political humor, in good form. Wow Libidiot, Obama is an amazing man - in your mind. But did he really "desecrate" al Qaeda? Won't all of his muzzie friends be pissed? No HOA here in this old neighborhood. The chair remains on my front yard. I will continue to make my statement -- too bad what my neighbors think. You have deleted your comment, but I have it in a permanent file via comment notification. Stop spamming by copying and pasting. Breaking News: Is It 1979 Again?